The complete guitar sonatas by Hans Werner Henze - a 20th century masterpiece inspired by Shakespearean characters. "He is a spectacular player and artist, fully up to the demands of this music. He has an impeccable technique, the intellect to comprehend and convey the works, and enough heart to hear the beauties behind the forbidding exterior. This is some remarkable music making." Guitarist Elliot Simpson has given premieres of works by such iconic and diverse composers as Sofia Gubaidulina, Alvin Lucier, and Michael Finnissy, and has collaborated with many acclaimed young composers including Hugo Morales, Ezequiel Menalled, Benjamin Staern, and Sahba Aminikia. He has been a guest of organizations including the Asko|Schönberg Ensemble, the San Francisco Symphony, the New European Ensemble, the György Ligeti Academy, and the Verband für aktuelle Musik Hamburg, as well as festivals and concert series throughout the United States and Europe in performances ranging from early music to free improvisation. He is a member of the contemporary music group Ensemble Modelo62 and, in the 2013/2014 season, will also perform and record as soloist with the Asko|Schönberg Ensemble under the direction of Reinbert de Leeuw. Awards include prizes at the international competitions of Zwolle (NL) and Nordhorn (DE), and the prestigious Huygens Grant from the Netherlands Ministry of Education, Culture and Science. 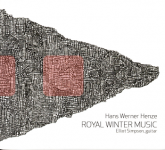 Recordings include the complete Royal Winter Music sonatas of Hans Werner Henze (Soundset Recordings), and the Suite for Just Intonation Guitar by Sahba Aminikia (Hermes Records). Liner notes include the composer's prefaces to each sonata. Recorded June 16-18, 2010 in the Lille Konsertsal, University of Stavanger, Bjergsted. Special thanks to Mark Drews and the University of Stavanger. "No notes on the performer, only some rather vague notes from the composer. Who is this person who chose the Royal Winter Music for his debut recording? He is a spectacular player and artist, fully up to the demands of this music. He has an impeccable technique, the intellect to comprehend and convey the works, and enough heart to hear the beauties behind the forbidding exterior. These two works, described by the composer as “Sonatas on Shakepearean Characters”, are huge, thorny compositions that make tremendous demands on the performer and almost as many on the listener. The opening movement of No. 1, ‘Gloucester’, is particularly harsh, as if to dissuade the timid listener from discovering the often ethereal beauties of some of the inner movements. The first was written for Julian Bream in the 60s, who gave its premiere recording; the second, cut from the same cloth, was written five years later. Mr Simpson, his website tells us, is from New Mexico and studied with David Tanenbaum at the San Francisco Conservatory (that explains the Henze connection: Tanenbaum’s very fine recording of these works is still available). 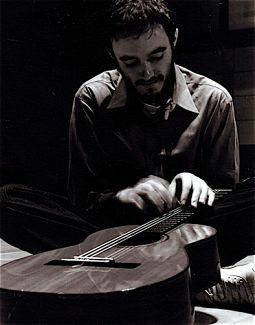 He did his graduate work at the Royal Conservatory of the Hague under Zoran Dukic, and is currently based in the Hague. This may not be his first recording- the website mentions another devoted to the music of Iranian composer Sabha Aminikia, though the disc is not on the site and appears not to be available. But this is some remarkable music making. Simpson is even more colorful than Tanenbaum, though the mark of his teacher is evident. I also prefer his performance to Franz Halasz on Naxos, though you won’t go wrong with any of the three."